For those following the discussions around The Chancellory at Trinity Park -- the highly-controversial condo project that would stretch as tall as seven stories in some spaces -- may want to take a look at the "Neighbors for Sustainable Development in Trinity Park" web site. The NFSDTP (say that three times quickly... or just once) blog has copies of materials presented to the Board of Adjustment in February by the group, which includes a number of residents of the southern end of the neighborhood. Definitely worth a read, and a look at some of the visual studies the group presented. The project developers were successful in getting an extension from the Board of Adjustment during the February meeting to provide one last opportunity for negotiations with the neighborhood association and the Sustainable Development neighbors' group. News flash: Franz Kafka has been hired as the new director of Durham's Park and Rec department, while Joseph Heller will be taking point at Planning. Well, not really, but the following recollection on Barry Ragin's blog sure makes it sound like it could have happened. For those not in the loop, the powers that be have stalled and forestalled on plans to allow the Duke Park Neighborhood Association to take over the bathhouse, all while converting part of the park to a storage and parking area for city vehicles. Part of the problem is that the city Parks and Recreation Department has closed off the parking lot in the north end of the park and converted it into a storage area. Now, the Planning Department is raising a red flag about parking for a building which it has allowed to sit abandoned and deteriorating for nearly 14 years? Read more about this over at Barry's place. Anyone who attended the Coffee with Council at E.K. Powe Elementary this month -- or anyone within a couple of blocks' earshot -- couldn't have missed hearing the most compelling and eloquent oration of the night. The pastor from St. John Baptist Church in Walltown spoke passionately, and convincingly, about the dangers of roots from certain street trees -- or as he boomed, STREET TREES -- that were slithering ever so dasterdly towards the edifice of his church. He spoke of them in the tone of warning more associated with the Great Serpent. And he told a long and sordid history of how the roots from one of these trees had already caused about $40,000 in damage to the plumbing work supporting an addition to the church. The roots, he intoned, were heading back towards the church. And, he noted, they already had made the sidewalk on Onslow Street buckle up from the level of the earth, creating a dangerous walking situation. He'd notified the City a couple of times, even the mayor's office, but hadn't seen a resolution. There was loud applause when the Reverend was done -- not to mention the occasional "Amen" from the audience during his speech. So I was driving down Onslow on Wednesday, on my way to a meeting, when, lo! what should I see, but the sight of what must have been a dozen Durham municipal employees out working along the sidewalk along half of the street. I stepped out of my car and took the photo shown here with my smartphone's camera. Now, people understandably get nervous when a perfect stranger stops and starts photographing you, so the crew supervisor comes over and greets me with a friendly "good morning," and we fall to talking. I mentioned I was at the Coffee with Council and I asked whether the dastardly tree would meet its end that morning. He smiled knowingly -- very knowingly. (City manager Patrick Baker had been asked by Bill Bell to follow up with the pastor that very night; like a gallon of WD-40 to a Swiss watch's gears, the municipal machinery had began to turn.) The crew was there to fix the sidewalk, the supervisor said. The dangerous strip of concrete would again be pedestrian-friendly. I asked whether the whole tree was coming down. The supervisor smiled again, even more knowingly. No, he said. The tree would not be coming down. But the sidewalk would be fixed. A reader asked last week if there was any more news about what's going on with Diamond View II/III and residential construction on the next phase of American Tobacco. As it happens, I had a chance to buttonhole Ken Reiter, senior development director with Struever Bros. Eccles & Rouse, after tonight's presentation on the Durham Athletic Park renovations. I'll touch more tomorrow on the DAP plans, but Ken was kind enough to give me an update on the ATHD project. Caveat: I wasn't taking notes at that moment and Ken was scribbling the site plan on the back of a business card... so this may be slightly off. I'll correct the post if errors pop up. 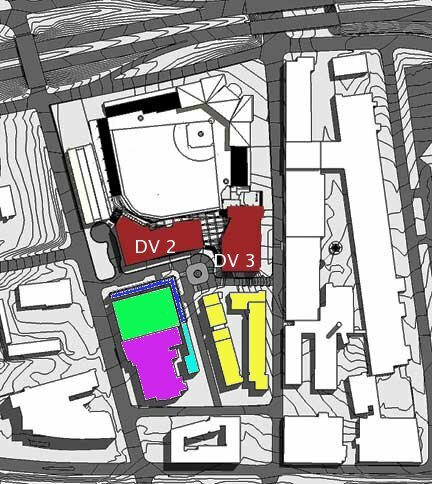 The two buildings in red are, of course, Diamond View II and Diamond View III; these will include the home of Chapel Hill I-bank Smith Breeden, now relocating to the Bull City. In purple is the Durham Performing Arts Center, a city project with Skanska as the construction manager at risk. (Thanks to Mike Woodard for pointing out that the developer is actually Garfield Traub.) Spring 2008 is the current working date for this 2,800-seat theater (which will be operated by Nederlander) to be open. Between Diamond View and the DPAC in green is the new East Deck parking garage discussed earlier this week after Monday's County Commission meeting. The dark blue thin space to the south and west of the garage will be the "wrapper" residential buildings. Just to its north in teal will be a restaurant--perhaps connected in some way to the residential wrapper, but a separate structure. Appearing in yellow are additional residential units. Although these appear as multiple buildings in the drawing, Reiter notes it will be a single structure from a construction perspective. So what's the schedule? Although Diamond View II/III and the DPAC (plus the renovations at the ballpark) are the currently-underway projects, all of these are expected to be under some form of construction by summer's end. Reiter hopes that everything will wrap up by the end of calendar year 2008, noting that the project is currently running about six months behind the target. As for the other mystery, the University Ford dealership listed as Phase Four on the American Tobacco website? Apparently the only outstanding issue is finding a new home for the dealership. So it looks like this plot remains available for future American Tobacco expansion -- someday. Incidentally, here's a five-year-old photo from Capitol Broadcasting's web site with a look at how all four phases were once envisioned. I for one am glad they lost the circle driveway off Willard. Everyone in Durham is saddened over the death of a 14-year-old girl, Tavisa Cartnail, in East Durham on Sunday night. Looks like she was literally in a very wrong place at a very wrong time: in an SUV with friends, on N. Driver Street at 11pm. We haven't talked much about this incident on BCR, and I feel like in time, we need to. We need as a whole community to think about how we can react and how we can support more intensively a part of our city that is not seeing the revitalization and investments -- in neighborhoods, in jobs, in civic life -- that the rest of Durham is benefitting from. On Tuesday, City Councilman Thomas Stith said he wants to know why the city is about to invest $13.5 million to open a vocational school yards from where Cartnail was killed. The city has approved just such a multimillion-dollar plan to convert the old Holton school into a vocational school, office space for the Durham Parks and Recreation Department and space for a Duke University Health System clinic by the start of the 2008-09 school year. "Why would you put additional investment into a situation that's not secure?" Stith asked. Stith said others disagree with him and say that the city should invest in the area as a means of rehabbing the blighted community, but those attempts will not and can not be successful, Stith said, until local leaders admit the city is in crisis. So let me get this straight. We have an area that is marked by crime, despair and violence -- in which there is massive underinvestment. There's a proposal on the table that will bring jobs and, just as importantly, people with honest, important business to the area. While providing health services to the neighborhood to boot. What Stith fails to seem to grasp here is that the thug-and-drug scenes just loves the blighted places... the areas that are deserted, that most people have no interest in coming to, day or night. And that certainly describes the Driver Street area. Bringing in local services and an educational facility is one way of turning on the flashlight that forces so many vermin to flee. Alternatively, we could ask Stith if he knows anyone with Magic Anti-Blight Pixie Dust that we could sprinkle over the area first before we open this school and services facility. A heads-up: If you've never been on one of John Schelp's walking tours of the West Durham-to-East Campus area, you've missed a special chance to find out more about Durham's history. I took the "urban hike" last spring and learned just a wealth of information about Durham's history: from why there's a Ninth Street but not an Eighth or a Tenth, to why there are some odd fountains in a peculiar spot on East Campus; to learning the history of Durham native and songwriter John D. Loudermilk. This spring's walk, which is sponsored by the Sierra Club, takes place this Saturday at 9:00am; meet up at Oval Park on W. Club Blvd. in Watts-Hillandale to join in the fun. If you want to see more details, keep reading after the cut below. First, the County has approved the final installment of the funding towards the American Tobacco parking decks initially allocated several years back in the long-negotiated deal that gave the project its start. 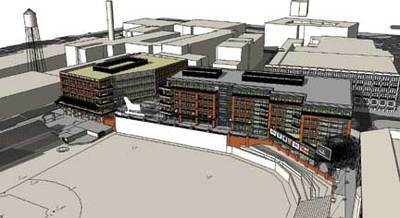 The 441-space "East Deck" will serve the new phase of American Tobacco, including the new Diamond View buildings being constructed behind the outfield of the Durham Bulls Athletic Park. Interestingly, neither article makes any mention of two points of interest. 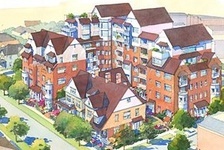 There's no discussion of the design plan to wrap the East Deck with residential units to create a more attractive structure, as posited over at the architect's web site; however, the decision by the County to turn the funds over to Capitol Broadcasting so it can own the garage rather than the government owning the garage as originally planned could be compatible with this. Additionally, there's no mention of the small point that this parking deck will help support the performing arts center being built right next door to Diamond View, though it would seem a major element in the center's support. Also of interest: the developer who was proposing to build over 1,000 homes and nearly as much retail square footage as all of Northgate Mall off of I-85 and Glenn School Road has withdrawn the proposal due to the cost of road improvements that would be required to the local infrastructure. With a Super Wal-Mart on the way down the street from the suggested location (oh, joy) we're bound to see residential in that area sooner than later, but it won't be this project. So I've done some head-scratching of late wondering what was up with the Trailways/Greyhound move over to the corner of Duke St. and Chapel Hill St. Looks nicer than the old station on Morgan St., to say the least, but why move, and why now? The mystery grew deeper when the old Trailways building suddenly got demolished just weeks after the bus companies' move to the south side of Brightleaf. Now, all is answered -- for the time being. Turns out the developers of the Studebaker Building (home of the old Playhouse at Brightleaf, now becoming office space for Ogilvy) have leased the old Trailways site as parking for their project, according to a post on the Trinity Park listserv. Good thing, too, since with all the new restaurants in Brightleaf, parking in the free lot between Main, Duke, Morgan, and Gregson is tougher than ever. Gary over at Endangered Durham remarked that this open lot would be a perfect location for a parking garage wrapped with apartments or retail -- though for now, I guess we have to settle for busy asphault. Developing this property is a "win-win" for everyone. Also, it provides the opportunity for the N.C. Department of Transportation to either reconsider its decision on the West Village location, or enter into an agreement with TTA to include the type of train station Durham deserves on the TTA property. No matter when this property is developed, the ideal development would be a high-density, mixed-use project that is compatible with the "transit-oriented development" that TTA desires. Why wait? Also, the property that TTA has under control is bordered by the following significant downtown development projects all within one block: the regional retail and restaurant destination district of Brightleaf Square; the major residential and mixed-use development of West Village; North Carolina Mutual Insurance Company office building recently purchased by Greenfire Development; the future home of the Durham Transportation Center that will begin construction this year; and, finally, the award-winning American Tobacco Historic Campus mixed-use project. The TTA property sits in the middle of some pretty impressive development projects.